It's winter and Phillip Island is quieter but there are still opportunities for special adventures with the arrival of the whales on their annual migration from the Antarctic. As we set out on a whale watching cruise with Wildlife Coast Cruises, I was reminded of the old Hollywood saying about not working with children or animals. That’s the thing with safaris or suchlike – you never can be sure of what you will see. Just because you want to see them doesn’t mean they will be there! Our Saturday morning 4 hour cruise with Wildlife Coast Cruises is to circumnavigate Phillip Island. The sighting of whales was the main interest of the passengers but we knew there would be plenty of other great sightings as well. Fortunately the weather was fine, with a calm Westernport Bay. The sea was a bit choppier along the south coast with the swell around 2 metres which made for a few seasickness casualties. Everyone was on the lookout for a “blow”. The whale has a blowhole on the top of its head (so it doesn’t have to get much of its body out of water). When it surfaces to breathe, used air is forcefully expelled from the lungs. This spray of warm air turns to vapour/steam when it hits the colder air and is known as the “blow”. No whales were sighted in the bay as we made our way to Seal Rocks. Although I have been to the colony several times, this one was a first with the water seething with 8 month old seal pups. 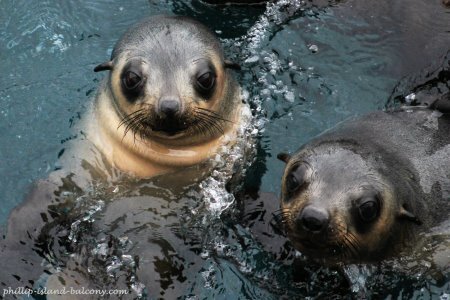 And they were so inquisitive, swimming up close to the Kasey Lee and looking up at the passengers as if to say hello! Delightful! Along the south coast an albatross followed us for a while and gannets could be seen diving down to fish. A few common dolphins raced alongside us or did their seemingly dangerous manoeuvres under the bow of the boat. From the Kasey Lee, The Pinnacles and the rugged coastline of Cape Woolamai, with its granite cliffs and caves, was a whole different perspective of the island. By now we knew our chances of seeing whales were not great but we still enjoyed more dolphins racing us, and seals popping up their heads as we passed. But still, no sightings of whales. We cruised under Phillip Island Bridge and passed Newhaven, Churchill Island and Rhyll. Although the tide was high, the tip of the wreck “Mina” could be seen peeping above the water. As we hadn’t seen any whales we were generously given a 50% discount card for another whale watching cruise. I’m planning that trip already and my fingers are crossed! 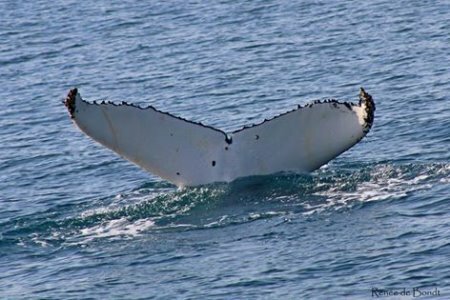 Footnote: This week a pod of 10 humpback whales were sighted off Cape Woolamai! After the whale cruise we dropped in to Mendls, part of Mingara Gallery. I always have a wander through the gallery, looking for the perfect painting for my lounge room wall. The gallery exhibits contemporary art by local and interstate artists. Exhibitions change regularly with also jewellery, sculpture, glass and ceramics being shown. 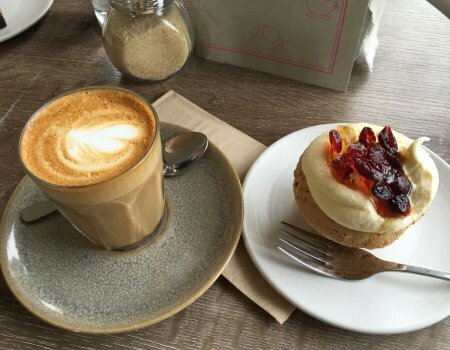 Mendls is a popular spot, with seating inside but also a lovely courtyard – more suitable for the summer months! There is always a yummy range of cakes and lunch dishes. Coeliacs have to stick to the gluten free cakes as the lunch dishes usually contain gluten, except for maybe a salad. A great place to chill out! When I go to the Koala Conservation Reserve I’m usually in a hurry to park the car and get inside the reserve to see what the koalas are up to. 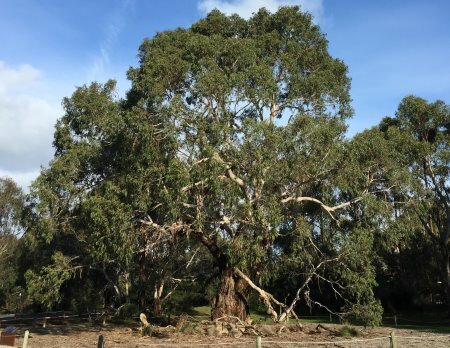 But in the car park, take the time to look for the huge manna gum to your left of the visitor centre. This wonderful tree, with a diameter of about 20 metres, is over 200 years old and one of the oldest trees on Phillip Island. How it managed to survive the clearing of the island for farming and other development is truly fortunate. Today it stands in all its glory, with gnarly trunk and smooth white branches, still watching over the island and still providing shelter for many of its creatures.